Get it, get it!!! Happy, playful pup!! Oh No....Quick....save that ball! It can't swim! My ball is going to drown. Call the life guard. That looks like an awesome ball to catch! SPLOSH!!!!! Have a wonderful Wednesday. Lucky dog to be playing in the pool! There's nothing better than a happy, wet dog. Hope you're having a fun summer Miley. Now THAT is what I'm talking about!!!!!! Cute pic, and oh, that looks so cool and refreshing! I'd love to dive right in! 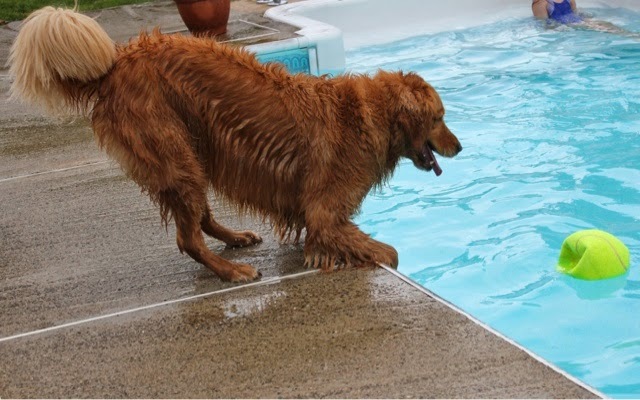 My Golden would have loved a swimming pool! I'd imagine that you swim like a fishie!! Yahoo!! Get it!! Oh, my dogs would SO love to have a pool!! Uh oh....looks like that ball is juuussssttttt out of reach! Your pool looks great, we're jealous!